This tutorial helps you prepare for Objective 101.2 in Topic 101 of the Linux Professional Institute’s Linux Server Professional (LPIC-1) exam 101. The objective has a weight of 3. I focus mainly on the classic SysVinit process and the newer systemd. In addition, I describe upstart. When you turn on a computer or restart it, the computer must load an operating system before you can do any useful work. This process is called booting the computer. The computer pulls itself up by the bootstraps, using a boot loader. The process is mostly automatic, but there are times when you might need to intervene, for example to boot installation media, boot to a repair mode, or boot a different operating system to your usual default. 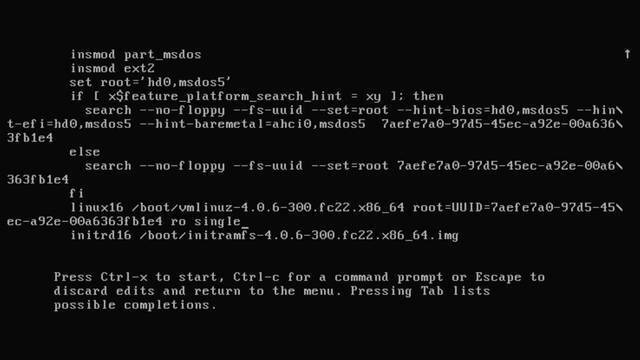 I show you how Linux booting works with the common Linux boot loaders and how you can interact with and then check the process. Some aspects of the boot process are common to most systems, but some hardware-related aspects are specific to a particular architecture. The material in this tutorial is directed specifically at x86 and x86_64 architecture systems using BIOS to boot the system. A newer system using Extensible Firmware Interface (EFI) and the GUID Partition Table (GPT) was developed for the Intel Itanium and IA64 architectures to overcome several limitations of the 16-bit x86 BIOS architecture, especially for the large servers that Itanium was intended for. Intel stopped developing EFI in 2005 at version 1.10 and contributed it to the Unified Extensible Firmware Interface Forum, which now manages it as Unified Extensible Firmware Interface (UEFI). UEFI is gaining popularity, particularly for systems having drives larger than 2TB in size. It is also required for computers running Windows® 8. To get the most from the tutorials in this series, you should have a basic knowledge of Linux and a working Linux system on which you can practice the commands covered in this tutorial. Sometimes different versions of a program format output differently, so your results might not always look exactly like the listings and figures shown here. In particular, BIOS settings vary widely between systems, and boot loader splash screens vary widely between distributions. Before we get into boot loaders, such as LILO, GRUB and GRUB2, let’s review how a PC has historically started, or booted. Code called BIOS (for _B_asic _I_nput _O_utput _S_ervice) is stored in non-volatile memory such as a ROM, EEPROM, or flash memory. When the PC is turned on or rebooted, this code is executed and performs a power-on self test (POST) to check the machine. It also determines the boot drive from the available removable or fixed storage devices and loads the first sector from the Master Boot Record (MBR) on that drive. The drive can be a traditional hard drive, solid-state drive, USB stick or drive, or a drive with removable media such as diskette, CD, or DVD. For the remainder of this tutorial, we’ll focus on hard drives, but the process is similar for the other types of storage devices. As discussed in the tutorial “Learn Linux 101: Hard disk layout,” the MBR also contains the partition table, so the amount of executable code in the MBR is less than 512 bytes, which is not very much code. Note that every disk, even a floppy, CD, or DVD, or solid-state device such as a USB stick, contains executable code in its MBR, even if the code is only enough to put out a message such as “Non-bootable disk in drive A:”. This code that is loaded by BIOS from this first sector is called the first stage boot loader, or the stage 1 boot loader. The standard hard drive MBR used by MS DOS, PC DOS, and Windows operating systems checks the partition table to find a primary partition on the boot drive that is marked as active, loads the first sector from that partition, and passes control to the beginning of the loaded code. This new piece of code is also known as the partition boot record. The partition boot record is actually another stage 1 boot loader, but this one has just enough intelligence to load a set of blocks from the partition. The code in this new set of blocks is called the stage 2 boot loader. As used by MS-DOS and PC-DOS, the stage 2 loader proceeds directly to load the rest of operating system. This is how your operating system pulls itself up by its bootstraps until it is up and running. This works fine for a system with a single operating system. What happens when you want multiple operating systems, say OS/2, Windows 7, and three different Linux distributions? You could use some program (such as the DOS FDISK program) to change the active partition and reboot. This is cumbersome. Furthermore, a disk can have only four primary partitions, and the standard MBR can have only one active primary partition; it cannot boot from a logical partition. But our hypothetical example cited five operating systems, each of which needs a partition. Oops! A DOS executable program that is invoked from a running DOS system to boot a Linux partition. This was popular when setting up a multiboot system was a complex and risky process. A program that was installed in a small dedicated partition. The partition was marked active, and the standard MBR boot process started the OS/2 Boot Manager, which has menu from which you can choose which operating system to boot. This tutorial focuses mainly on GRUB2 with discussion of GRUB and LILO mostly for historical perspective. Evidently, if you can pass control of the system to some program that has more than 512 bytes of code to accomplish its task, then it isn’t too hard to allow booting from logical partitions, or booting from partitions that are not on the boot drive. All of these solutions allow such possibilities, either because they can load a boot record from an arbitrary partition, or because they have some understanding of what file or files to load to start the boot process. When a boot manager gets control, one thing that it can load is another boot manager. This is called chain loading, and it most frequently occurs when the boot manager that is located in the MBR loads the boot loader that is in a partition boot record. This is almost always done when a Linux boot loader is asked to boot a Windows or DOS partition, but it can also be done when the Linux boot loader for one system is asked to load the boot loader for another system. For example, you might use LILO in one partition to chain load GRUB in another partition in order to access the GRUB menu for that partition. As noted in the introduction, EFI was developed by Intel to overcome several limitations of the x86 BIOS architecture, notably the 16-bit especially for the large servers that Itanium was intended for. Intel stopped development of EFI in 2005 at version 1.10 and contributed it to the Unified Extensible Firmware Interface Forum, which now manages it as Unified Extensible Firmware Interface (UEFI). Since 2013, the UEFI Forum has also managed the Advanced Configuration and Power Interface or ACPI, a specification for device configuration and power management. In contrast to 16-bit BIOS, UEFI is either 32-bit or 64-bit. It is possible to have a 32-bit UEFI on a 64-bit processor (for example some Intel Atom processors used in many tablets and small notebook computers). The boot loader needs to match the UEFI: a 32-bit boot loader on 32-bit UEFI and a 64-bit boot loader on 64-bit UEFI. Many, but not all, UEFI implementations allow booting in either UEFI mode or in Legacy BIOS mode. Such systems allow booting with a boot loader that does not support UEFI. However, if the system only supports UEFI, you need an appropriate UEFI boot loader, such as GRUB2. From here on, we focus on GRUB2, the boot loader included with most newer Linux distributions. LILO was used on many early Linux distributions. GRUB is newer. The original GRUB has now become GRUB Legacy, and GRUB2 is the newer version that is developed under the auspices of the Free Software Foundation (see the resources at the right side for details). A new version of LILO is called ELILO (which was developed for booting systems that use EFI. However, it is no longer in active development. See the resources at the right side for additional information about ELILO. When a PC is turned on, the Basic Input Output Service (BIOS) performs a self test. When the machine passes its self test, the BIOS loads the MBR, usually from the first 512-byte sector of the boot drive. 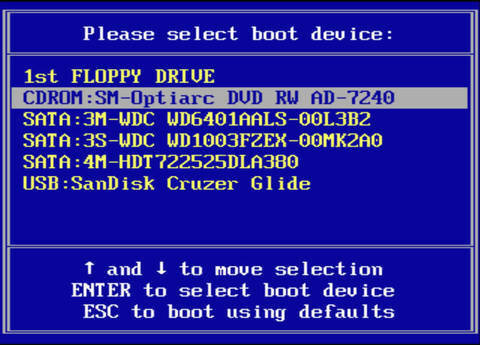 The boot drive is most often the first hard drive on the system, but might also be a diskette, CD, or USB key. For a hard drive, the MBR loads a stage 1 boot loader, which is typically either the LILO or GRUB stage1 boot loader on a Linux system. This is another 512-byte, single-sector record. The stage 1 boot loader usually loads a sequence of records called the stage 2 boot loader (or sometimes the stage 1.5 loader). The stage 2 loader loads the operating system. For Linux, this is the kernel and possibly an initial RAM disk (initrd or initramfs). Refer to the companion tutorial “Learn Linux, 101: Boot managers” if you need to review boot loader installation or basic booting. Change the device from which you boot. If you normally boot from a hard drive, you might need to boot from a floppy disk, a USB memory key, a CD or DVD, or a network. Setting up such alternate boot devices requires your BIOS to be appropriately configured and can require a particular keystroke during boot to display choices. illustrates the choices on one of my systems. The method for setting up boot devices and selecting a boot device at startup is specific to your system and its BIOS. It is also beyond the scope of this LPI objective’s requirements, so consult your system documentation. Interact with the boot loader to select which of several possible configurations to boot or to edit the boot configuration. You learn how to do this for GRUB2 in this tutorial. Pass parameters to the kernel to control the way that your kernel starts the system once it has been loaded by the boot loader. When GRUB2 loads, it presents information from a configuration file, normally located in /boot/grub/grub.cfg or /boot/grub2/grub.cfg. Listing 1 shows a small part of a grub.cfg file for a Fedora 22 system. I broke some lines for publication and indicate these with a trailing backslash (). When GRUB2 reads the configuration file, it normally presents a menu such as the one shown in . Typically, you have a short timeout, after which a default entry is booted. The default entry is highlighted, and you might see a timer counting down. Here, you see the menu entry from the previous listing as the default choice. If no action is taken, it boots in 35 seconds. When the menu is displayed, you can press Enter to boot the selected entry immediately, or you can press another key to stop the timeout. You can then highlight and boot another entry, enter e to edit a selected entry, or c to enter a GRUB2 command prompt. Note: if your timeout is set to 0, GRUB2 proceeds immediately to boot your system. In this case, you need to boot rescue media from another device. See the companion tutorial “Learn Linux, 101: Boot managers” for details. 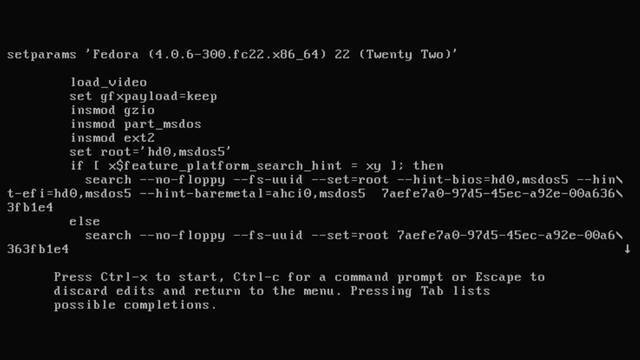 That tutorial also covers use of the GRUB2 command line, so I won’t cover that in this tutorial. Let’s now look at kernel parameters and the init process, and then I show you how to edit GRUB2 entries to pass parameters. Kernel parameters (sometimes called boot parameters) are used to supply the kernel with information about hardware parameters that it might not determine on its own, to override values that it might otherwise detect, or to avoid detection of inappropriate values. Some older kernel levels required a parameter to enable large memory support on systems with more than a certain amount of RAM. You might want to boot in single-user mode to repair your system, boot an SMP system in uniprocessor mode, or specify an alternate root filesystem. Or you might need to specify a previously working kernel so that you can find out why your newly built custom kernel won’t boot. You can accomplish all of these tasks using boot parameters. The kernel checks to see if the argument is any of the special arguments ‘root=’, ‘nfsroot=’, ‘nfsaddrs=’, ‘ro’, ‘rw’, ‘debug’ or ‘init’. It walks a list of setup functions to see if the specified argument string has been associated with a setup function. Anything of the form ‘foo=bar’ that is not accepted as a setup function is then interpreted as an environment variable to be set. Any remaining arguments that were not picked up by the kernel or interpreted as environment variables are then passed onto process one, which is usually the init program. You can find out more about boot parameters from the man pages using info bootparaminfobootparam or man bootparammanbootparam. Up-to-date information is also supplied in the kernel-parameters.txt file, which should be available in the kernel-doc package. Note: At the time of writing, Fedora 22 does not appear to have a kernel-doc package or kernel-parameters file. Suppose you want to modify kernel parameters or add new ones or otherwise change the values from the menu entry in the grub.cnf file. When you see the GRUB2 menu, you can edit the entry that you want to modify by selecting it and then pressing e. You then see a screen like , where you recognize information from the first few lines of Listing 1. The most common argument that is passed to the init process is the word ‘single’ which instructs it to boot the computer in single user mode, and not launch all the usual daemons. You typically use this for some kind of rescue operation. If you move the cursor down, the screen will scroll and you will see the line that starts with ‘linux16’ and ends with ‘ro rhgb quiet’. For our example, we’ll position the cursor at the end of this line and then use the backspace key to erase the words ‘quiet’, then ‘rhgb’. This will stop the Red Hat Graphical Boot screen that fedora normally display during boot and also stop suppressing many of the messages that are normally generated. Finally we’ll add the word ‘single’ to the line to boot in single user mode. The display is shown in . Now press Ctrl-x to boot the system into single user mode. After several messages scroll by, your screen has a few lines like Listing 2. You can now give the root password and do whatever you need to rescue the system. You can then reboot, or continue into your normal mode of running. Exactly how single user mode appears differs by system. Some systems take you directly to a root prompt with no need to enter a password. Others, like our example, require a password. How you proceed also differs according to whether your system uses the classic System V init process or the newer upstart or systemd. Now let’s look more at the different init processes. When the kernel finishes loading, it usually starts /sbin/init. This program remains running until the system is shut down. It is always assigned process ID 1, On systems using the traditional System V init process, or on systems using the newer Upstart initialization, the process will be named init. However, on systems using the Systemd initialization process, /sbin/init is a link to the systemd init process in /lib/systemd/systemd. We illustrate this for Fedora 22 in Listing 3. In normal operation, a traditional System V init process runs in one of 4 possible multiuser runlevels, 2 through 5. Different systems use runlevels differently, but the highest one used is usually for graphical operation with the X Windows system. The file /etc/inittab controls which processes are started at each runlevel. Systems using upstart have a concept of jobs, while systems with systemd use units to define what things are started and each maps appropriate jobs or units to the traditional System V runlevels. This allows many commands such as telinit to have meaning with the new startup processes. Many of the systemd units are stored in /usr/lib/systemd/system/. Listing 4 shows the mapping from runlevel-equivalent targets to the corresponding systemd targets. are all equivalent ways of getting to single user mode. You can find out more about systemd units and targets in the man pages. Try info systemdinfosystemd or man systemdmansystemd. Whichever initialization you use, the initialization program boots the rest of your system by running a series of scripts. For System V init, these scripts typically live in /etc/rc.d/init.d or /etc/init.d. They perform services such as setting the system’s hostname, checking the filesystem for errors, mounting additional filesystems, enabling networking, starting print services, and so on. When the scripts complete, init starts a program calledgetty, which displays the login prompt on consoles. Graphical login screens are handled with a graphical display manager, such as GDM for Gnome. See the companion tutorial “Learn Linux, 101: Runlevels, boot targets, shutdown, and reboot” for more information on the different startup processes. If your system loads a kernel but cannot run init successfully, you can try to recover by specifying an alternate initialization program. For example, specifying init=/bin/sh boots your system into a shell prompt with root authority, from which you might be able to repair the system. Needless to say, if you have to apply the same set of additional parameters every time you boot, you should add them to the configuration file. You might have noticed the last couple of lines in our GRUB2 example configuration, shown again in Listing 5. The linux16 line specifies what kernel to load and the initrd16 lines specifies ad Initial RAM Disk. You’ve already seen how to modify the kernel parameters, but what is an initial RAM disk? Back at the dawn of UNIX, devices were few and kernels were small. Most devices were physically attached to a computer all the time and a kernel was typically built to support exactly the installed hardware. As time went by and the number and type of devices proliferated, device support was frequently shifted into loadable kernel modules. Kernel modules are like a library of functions with well-defined entry points that allow a kernel to use a device whose support was not compiled in to the kernel. This allowed a kernel to be loaded and then load support only for devices that were actually installed in the system. But without full disk and filesystem support, how do you find and load these modules from disk? The answer is the initial RAM disk or initrd or initramfs, which is a file containing loadable kernel modules. It is usually compressed and is loaded into RAM by the boot loader. The kernel is given access to it as if it were a mounted file system. If you examine an initrd file using the file command, you can find what compression it uses. If you then uncompress a copy of it, you usually can find a cpio archive inside. On some systems (such as Fedora since Fedora 12), the initrd file is created with a utility called dracut. In this case, it appears as a cpio archive, but if you unpack it, you might not find very much: much less than the initrd file size would suggest. You can use the lsinitrd command to list the contents of an initrd file. During the Linux boot process, a large number of messages are emitted to the console, describing the kernel being booted, the hardware of your system, and other things related to the kernel. These messages usually flash by quickly, and you probably won’t be able to read them, unless there is a delay while the boot process waits for something, such as inability to reach a time server, or a filesystem that must be checked. With the advent of the Linux Bootsplash project (see the resources at the right side), these messages might be superimposed on a graphical background, or they might be hidden and replaced by a simple status bar. If your distribution supports the hidden mode, you will usually be able to switch back to displaying boot messages by pressing a key such as F2. It’s nice to be able to go back and review the kernel messages. Because standard output is related to a process, and the kernel does not have a process identifier, it keeps kernel (and module) output messages in the kernel ring buffer. You can display the kernel ring buffer using the dmesg command, which displays these messages on standard output. Of course, you can redirect this output to a file for later analysis or forward it to a kernel developer for debugging purposes. Listing 6 illustrates some of the output that you might see. Again, I have broken long lines for publication as indicated by a trailing backslash (). The kernel ring buffer is also used for some events after the system is booted. These include certain program failures and hot-plug events. Listing 7 shows several entries related to plugging in a USB memory key. Note the warning that the volume had not been properly unmounted. [68227.882986] FAT‑fs (sdf): Volume was not properly unmounted. Some data may be corrupt. Once your system has started to the point of running /sbin/init, the kernel still logs events in the ring buffer as you just saw. However, processes use a daemon to log messages. In traditional System V init systems, this is the syslogd daemon, which usually logs to /var/log/messages. Systemd-based systems use the systemd-journald daemon to log messages, which can be inspected using the journalctl command. In contrast to the ring buffer, each syslog line has a timestamp, and the file persists between system restarts. This file is where you should first look for errors that occurred during the init scripts stage of booting. Most daemons have names that end in ‘d’. Listing 8 shows how to see the last few daemon status messages after a reboot. It also shows the last 10 messages of any type. This example is from a CentOS 6 system. Jul 22 21:45:23 attic4‑cent rsyslogd: [origin software="rsyslogd" swVersion="5.8.10"
Jul 22 21:46:00 attic4‑cent kernel: TECH PREVIEW: btrfs may not be fully supported. Jul 22 21:46:00 attic4‑cent kernel: Please review provided documentation for limitations. Shutdown events are also logged, so if your system is not shutting down cleanly, you might be able to find the cause in the log information that is left from the last shutdown. You can also find logs for many other system programs in /var/log. For example, you can see the startup log for your X Window system. Along with the large amount of function that has come under the new systemd umbrella is a new journalling function managed by the systemd-journald daemon. If your system is using this daemon, your log is managed by it and you can use the journalctl command to view the messages. Listing 9 shows the first page of output from the journalctl -xbjournalctl-xb command which displays journal entries from the current boot. Jul 22 22:02:25 atticf20 kernel: SMBIOS 2.5 present. As usual, consult the man pages for systemd-journald and journalctl for more information. This completes your introduction to guiding your Linux system through the boot process. ELILO: EFI Linux Boot Loader Learn about ELILO at the ELILO: EFI Linux Boot Loader project home page.